Hawaiian Volcanoes, From Source to Surface is the outcome of an AGU Chapman Conference held on the Island of Hawai‘i in August 2012. 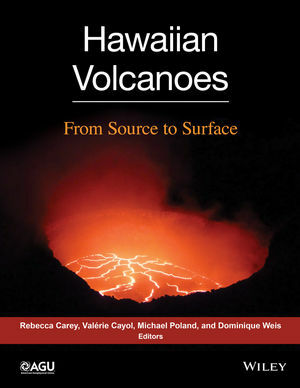 As such, this monograph contains a diversity of research results that highlight the current understanding of how Hawaiian volcanoes work and point out fundamental questions requiring additional exploration. Hawaiian Volcanoes, From Source to Surface will be a valuable resource not only for researchers studying basaltic volcanism and scientists generally interested in volcanoes, but also students beginning their careers in geosciences. This volume will also be of great interest to igneous petrologists, geochemists, and geophysicists. Rebecca Carey is a postdoctoral researcher in School of Earth Sciences at the University of Tasmania. Rebecca's research interests revolve around the physical aspects of volcanology: processes of magma ascent and degassing, fieldwork deposit mapping, synchrotron microanalytical techniques - both FTIR and Micro X-ray tomography. Michael Poland isa research geophysicist at the U.S. Geological Survey in the Hawaiian Volcano Observatory.He has about ten peer-reviewed publications including in the Nature Geoscience and Geophysical Research Letters. He conducts research in deformation monitoring of Hawaiian volcanoes and in active volcanism. Valerie Cayol is a research associate in The National Center for Scientific Research (CNRS) at the Univeristy of Blaise Pascal, Clermont-Ferrand, France. He has five major peer-reviewed publications in the Journal of Geophysical Research. His research focuses on numerical modeling of stresses and deformations, inversion of surface deformation data, development of methods allowing the simultaneous inversion of geometries and stress distributions on fractures or in the volume, joint inversion of deformation data and seismicity, study of magma transfer and storage within volcanic edifices, study of the interaction between magma transfers and the tectonics. Professor Dominique Weis is a full professor and Canadian Research Chair in the department of Earth and Ocean Sciences at the University of British Columbia. She is the Director of the Pacific Centre for Isotopic and Geochemical Research (PCIGR) at University of British Columbia. He has been a fellow of AGU (2010) and Geochemical Society/European Association of Geochemistry (2011). He has over 165 peer-reviewed publications in reputed journals including Nature Geoscience and Geochemistry, Geophysics, Geosystems. His research interests include isotope geology, petrology, volcanology, geochronology and environmental sciences with special focus on defining the source and evolution of igneous and metamorphic rocks, the interactions between different reservoirs (mantle, crust and atmosphere) and the role of tectonic settings, geochemical and isotopic studies of sedimentary rocks, global changes and reconstitution of past environments, distribution of pollutants in natural and anthropogenic systems and application of non-traditional heavy stable to environmental issues and analytical technique developments.